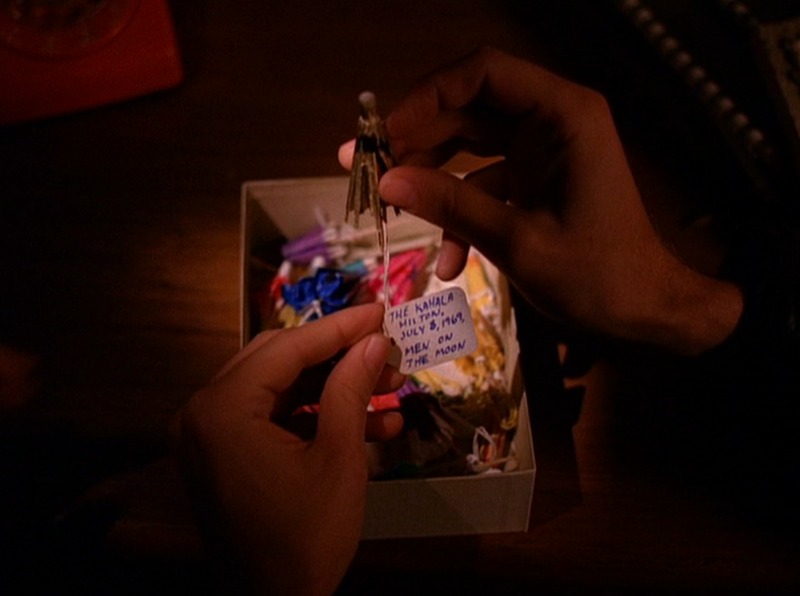 Lost in the Movies (formerly The Dancing Image): TWIN PEAKS First Time Viewer Companion: S1E8 "The Last Evening"
TWIN PEAKS First Time Viewer Companion: S1E8 "The Last Evening"
This is where the limitations and strengths of season 1 come to a head. I say "limitations" because "flaws" would be too harsh. There isn't anything inherently wrong with these aspects of this episode (and the preceding episodes), but compared to what is to come they do seem like inhibitions. That is to say these episodes are wonderful entertainment that epitomizes what a tightly-plotted, well-crafted, imaginatively populated network TV show circa 1990 is capable of. But they don't transcend that, except perhaps for the dream episode and maybe the pilot. This is something I've been feeling particularly in this rewatch, which is slower than any other I've ever done (& my first straightforward watch-through in about a year and a half). Usually, speeding through these episodes I'm caught up in their sense of escalating tension and struck by their well-hewn perfection in contrast to the more uneven season 2. Spacing them out, however, they are enjoyable but feel a bit...slight. That's especially true of this finale, which lacks the atmosphere of the woods, the eerie undercurrent of uncanny psychic magic, and the patient, even frustrating, allure of a mystery very slowly sucking you in. It's fast, action-packed, centered around bustling areas of public community: the casino, the sheriff's station, the hospital, and so forth. But yes, this is also a strength! Over the previous 7 episodes, we've come to know and care about these characters, and this episode thrives on that knowedge. While there's more action and high-pitched drama here, there's also a lot of dialogue. We get real glimpses into the relationships of Hank and Norma and (my favorite) Pete and Catherine, and also into Laura. Characters are challenged and forced to show their true colors. Some grow (Andy, maybe Catherine), some are overcome (Leo, Jacoby), some face challenges we won't see resolved until the new season begins (Coop, Audrey). The episode is best seen through the lens of Mark Frost. For him, Twin Peaks was never just about a single murder mystery but about the complex interrelations of a fully-drawn community, an - as he described it - Dickensiom tapestry using a small lumber town as its backdrop. That type of storytelling could theoretically go on forever, but many critics at the time were nervous about the prospect of more. A few days before this episode aired in May 1990, ABC greenlit a lengthy, 22-episode season to begin airing in 4 months. More than one TV columnist admitted reservations. Speaking for many, Rick Kogan write in the Chicago Tribune: "Spending time with the "Twin Peaks" that concludes Wednesday was like a great vacation in a place you've never been. Watching the series, I`m afraid, will be like looking at pictures of that vacation - interesting, perhaps evocative, but without the fire of being fresh." In essence, the very short experimental season ABC had commisioned functioned like a self-contained miniseries, a True Detective of its time. Extension risked dilution. Next: "May the Giant Be With You" • Previous: "Realization Time"